CCTV Camera Pros stocks Zavio Fisheye Cameras and is a master distributor for all Zavio products. Zavio Fisheye cameras include a 32 channel IP camera software that is compatible with all Zavio cameras. CCTV Camera Pros will ship all products worldwide. If you have any questions regarding Zavio products, please contact us - CCTV Camera Pros. Customers looking for older Zavio IP Cameras? 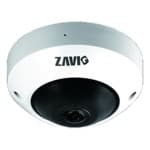 Customers looking for older Zavio IP Cameras should visit our Discontinued Zavio IP Camera page. This page contains discontinued Zavio IP cameras that are still fully supported by CCTV Camera Pros.